The Bullock Model 4900 Curtain Fire Dampers is installed to protect airconditioning and ventilation penetrations through fire rated walls or slabs. This model damper has been tested for 4 hours in a masonry wall and concrete slab and 2 hours in a steel stud plasterboard wall. Openings in fire rated walls or slabs shall be protected by a Bullock Model 4900 Curtain Fire Damper or approved equivalent. Dampers shall be provided where shown on drawings and wherever required to meet local regulations and must comply with AS1682.1-2015. Dampers shall be installed in strict accordance with the manufacturer’s installation instructions, to comply with the certificates of test furnished by the manufacturer. The damper’s construction must be in compliance with the tested prototype. The body being made with galvanised steel with any welds coated with cold zinc primer type paint to prevent rusting. The damper body must be strong and rigid to prevent operational damage during transport and/or installation on site. The damper’s expansion gap must be constantly maintained with the use of the patented Bullock’s Metal Gap Spacer sealing system, complying with AS1682.2-2015 or and approved equivalent. 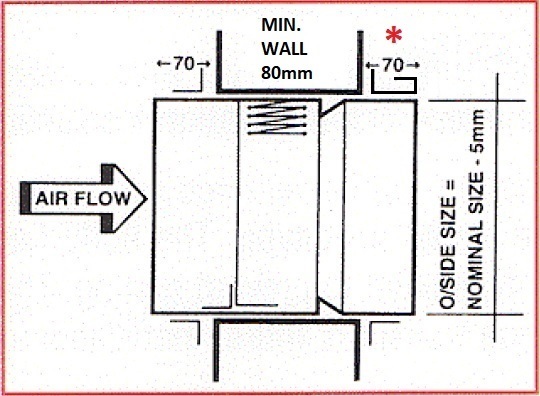 Fusible link are to operate at 68°C or have an AS1890 rating. Compliance with installation instructions is critical. 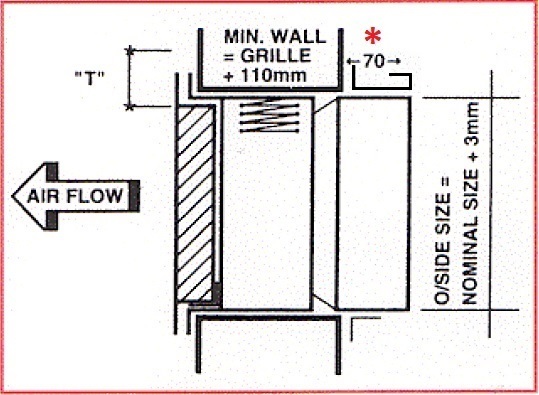 Refer to separate wall type/slab type installation instructions to suit your requirements. This model requires little maintenance once install. Refer to AS1851-2012 for detailed servicing procedures.